If you are searching for a stylish, relaxing, comfortable, friendly place to stay in Santorini, I cannot recommend Kalestesia Suites highly enough. 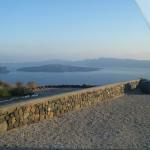 The location of the suites give panoramic views of the caldera and most of the island, though the location is a little out of the way and without precise directions quite difficult to find, more so if you arrive after dark as we did. 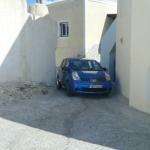 Do not hire a car any larger than a Nissan note as the suites are reached through a very narrow gap between buildings ( see photo) Kalestesia Suites are perfect for couples who want a relaxing break so iIf you want to be in the centre of the action this is not the place for you, although the main centres of Fira, Oia or Kamari can be reached easily by car or bus. The centre of Akrotiri, with its few retaurants, is within a twenty minute walk down a steep hill. I cannot praise the staff highly enough, they are very friendly and helpful. In fact one morning whilst having breakfast ( which was excellent and filling) a tourist arrived explaining to Leftie, the waiter (terrific bloke), he was lost and asking for directions. After trying to explain how to get to his destination for 5 minutes with little success,Leftie jumped into his car for the tourist to follow to his destination. I must add Leftie did not abandon his guests. The restaurant and...If you are searching for a stylish, relaxing, comfortable, friendly place to stay in Santorini, I cannot recommend Kalestesia Suites highly enough. The price you found is 38% lower than this hotel's average rate of $197/night. The price you found is 28% lower than this hotel's average rate of $86/night. The price you found is 42% lower than this hotel's average rate of $657/night. The price you found is 37% lower than this hotel's average rate of $253/night. We had the best time staying at Kalestesia Suites. It's in a quiet part of the island and away from the crowds and feels like a real getaway. Sampson and his team anticipated everything we needed and really made our stay feel effortless. The chef at the restaurant was fabulous and we had some of the best food at the hotel during our stay in Santorini. A car is a definite must as the hotel is not within walking distance to the village or any other amenities. This resort is stunning. Set high above the sea in the southern portion of Santorini you have perfect views of the entire island and its surroundings. This sunset was amazing and at night the towns of Thira &Oia are like jewels. Samson was an amazing host going out of his way to please. The wait staff was equally professional. The pool area is one of the most beautiful I have ever seen. The drive to get here is not for the faint of heart as the road is tiny in spots, but well worth the effort. Rooms are new and very nice.